Are Jadeveon Clowney's actions caused by agent whispers? Published: Oct. 7, 2013 at 03:00 p.m. Updated: Oct. 7, 2013 at 03:34 p.m.
Did Jadeveon Clowney buy into the hype this past offseason, neglecting his workouts and training regimen? I'm not here to judge Jadeveon Clowney. I'm not here to say the man didn't have a reason to tell his coach, minutes before Saturday's kickoff, he wasn't going to play. I'm not here to say he didn't have legitimate health reasons for making the surprising call. However, I am here to say this: With players of Clowney's caliber -- top players on Saturdays who have bright futures on Sundays -- there are always people offering advice, bad advice. And many times, they come in the form of parents or advisors through the parents, including agents. We call it the triangle in the scouting business: Player, coach, representative. Coach expects player to play if he's medically cleared. Representative tells player if he's not 100 percent healthy, don't play. With the rep it's less about doing further bodily injury than it is about doing damage to scouting tape that he thinks can come back to haunt the player in the draft process. That's where agents get it wrong: NFL clubs always communicate with college trainers after each season, requesting injury status in contests where a player might have appeared "off" his game. I did it all the time when I was with the Dallas Cowboys. We wanted to know all instances in which the player was playing at less than 100 percent. If he didn't play well in a particular game because of health reasons, we never, ever held it against him. There were a ton of NFL scouts at South Carolina's victory over Kentucky on Saturday. They were there mostly to see Clowney in person. Surely, Clowney knew it, which might have played into the decision he made, or the poor advice he received from a representative. Check out the top 10 all-time NFL players from South Carolina. 1. Steve Spurrier might be questioning his defensive end's commitment to South Carolina this season, but there are many in the scouting community who questioned his commitment to excellence this past offseason. 2. He's not playing poorly this season, but he's certainly not living up to the huge expectations. 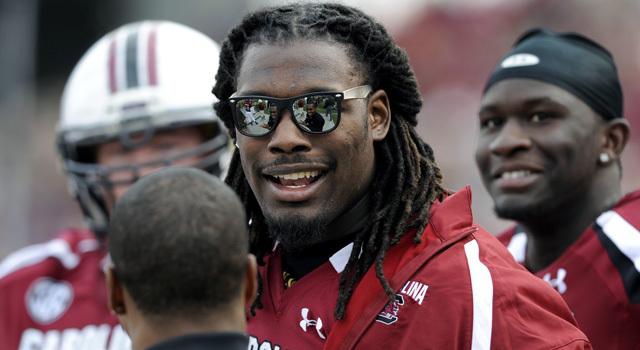 To the first point, did Clowney buy into the hype coming off his performance in the Outback Bowl? Did he work out in the offseason as much as he should have? There were indications early on this season that his conditioning wasn't where it needed to be. This is where a good representative would step in and advise the player to ignore the headlines and commit to getting better. As to the second point, this is where there seems to be a split opinion. Is Clowney the best defensive prospect of the last decade or is he simply a dominant college player with a chance to be very good, if not great, in the NFL? There are many people who do player evaluations, but not many who do them well. How many times did we see this written or said about Clowney over the past six months: "He's the best defensive player I've ever seen in my life." I'm not going to say I didn't like Clowney, because I did and do. But he made a play, a memorable play that got him a lot of attention he wouldn't have otherwise received -- certainly not to the level it got to. Dwight Clark had The Catch, Eli Manning had The Catch II. I was never a Clark guy; he made one great catch. I always liked Manning as a player, but sometimes a play will take you from a very good player to a great one, and no one questions it. Clowney's not a one-play wonder. He has a lot of really good tape from his first two seasons at South Carolina. But I'm not sure if it were May 8, and I was directing the draft for a team with a top pick, that I wouldn't take UCLA LB Anthony Barr over Clowney. Forget all the talk about his commitment; I'm strictly talking about his play on the field. In player evaluation, it's so important you look at the entire tape. As tempting as it is to overreact to one play or buy into the hype, you can't do it. Can't do it as a player, can't do it as an evaluator. » On Saturday, Baylor put up a Big 12-record 864 yards of total offense -- 468 rushing, 396 passing -- in beating West Virginia 73-42. The Bears have scored 69, 70, 70 and 73 points in their first four games. It is the 73 that is opening eyes because the Mountaineers were the first legitimate team Baylor had faced this season; WVU was coming off a nine-point victory over Oklahoma State and were competive against Oklahoma in Week 2. I think it's a big mistake to continue leaving Baylor out of the top 10 teams in the country. Hear that, voters? » Speaking of top 10, here's how I see them coming off the weekend: 1. Alabama, 2. Oregon, 3. Ohio State, 4. Stanford, 5. Georgia, 6. Florida State, 7. Clemson, 8. Louisville, 9. LSU, 10. Baylor. I'm not sure Georgia can stay in top 10 for much longer with all the injuries piling up; the Bulldogs lost three more players on Saturday in an OT win over Tennessee. » I was on the sideline of Notre Dame's victory over Arizona State on Saturday at AT&T Stadium where the Dallas Cowboys play. I love the uniforms the Irish were wearing, which included green socks and shoes. If you missed them, you can see them here. » Ohio State improved its record to 6-0 and is the first team to become bowl eligible. After beating Wisconsin and Northwestern in back-to-back weeks, the only real challenge left on the Buckeyes' regular-season schedule is the finale at Michigan. Urban Meyer might be looking at a second straight undefeated season.